A Swiss composer born in 1958 in Genève. Michael Jarrell studied composition and the visual arts. He trained at the Geneva Conservatory with Éric Gaudibert and followed composition seminars at Tanglewood (USA, 1979), the Staatliche Hochschule für Musik in Freiburg im Brisgau with Klaus Huber, then at Ircam (1986-88). He was resident in Rome from 1988 to 1990 at the Villa Medici, then at the Swiss Institute. Michael Jarrell has been teaching composition at the Musikhochschule in Vienna since 1993 and at the Geneva Conservatory since 2004. His music often has links with the plastic arts or literature, develops recurrent motives and flows from work on instrumental gestures and on the organisation of form in relation to tone-colour. 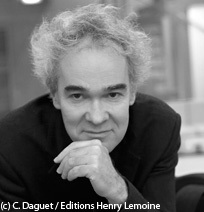 His works include Dérives (1985, first performance in Geneva), Essaims cribles (1988), Congruences (1989, first performance at Ircam), From the leaves of shadow (1991), Cassandre (1994, premiered at Châtelet, Paris), Aus Bebung (1995), Abschied (2001), the opera Galilei (2005, premiered at the Grand Théâtre in Geneva), Un temps de silence (2007), Le père (2010, music theatre). Les partitions de Michael Jarrell sont éditées par les éditions Lemoine. ALBÈRA Philippe. Entretien avec Michael Jarrell. Accents, 2005, n° 27, p.4-5. BAYLE Laurent (dir.). Michael Jarrell. Paris : Ircam, 1992, 84 p. (Cahier de l'Ircam. Compositeurs d'aujourd'hui).